Whether it be known as the Blood and Ice Cream Trilogy or the Cornetto Trilogy, Edgar Wright, Simon Pegg and Nick Frost’s post-‘Spaced’ sequence of films is now complete, and gosh if it isn’t one of the best trilogies in existence. Those concerned that they’d fumble on the third film, like so many other series (Scream, The Godfather, the original Star Wars trilogy, Blade, The Terminator, X-Men, Spider-Man etc etc), can rest assured that The World’s End is just as fast paced, witty and steeped in genre as the first two. The plot sees five friends reuniting after 20 years to partake in a pub crawl that they never completed back when they first finished high school. Except it’s really only Gary King (Simon Pegg) that wants to do the crawl. All the others – Oliver (Martin Freeman), Peter (Eddie Marsan), Andrew (Nick Frost) and Steven (Paddy Considine) – are doing quite well in their adult lives, and feel no particular need to relive their ‘glory’ years. As was the case with Hot Fuzz, Pegg gets the juiciest role. Though it’s another case of a man who refuses to grow up (as with Shaun), Gary’s got a nihilistic, devious personality, and is a long way from the type of roles Pegg’s landed in Hollywood. The script does a similar favour for Frost, who’s no longer playing the bumbling tubby guy. If there is a major difference between The World’s End and the first two Cornetto films, it’s that the genre elements feel decidedly secondary. I know people made a big deal about Shaun of the Dead being a romcom with added zombies, but it was really the other way around. This film, however, primarily focusses on the real world, dramatic part of the story, and the science fiction element is secondary. Some may find this disappointing, but I simply found that it showed how Pegg and Wright have matured as writers. I saw Wright, Pegg and Frost a few weeks ago at a Q & A after a screening of Shaun of the Dead, and they talked about their favourite scripts being all about set up and pay-off – a time-honoured technique, to be sure, but perhaps something that has been missing in Hollywood of late. The trick, of course, is to ensure that Chekov’s gun isn’t too blatant, and they have really fulfilled those criteria with The World’s End. The script is like a cleverly constructed puzzle where you can’t see the joins between the pieces – or at least you don’t recognise them until you’re thinking about the film on the drive home afterwards. As with all of Wright’s films, this is a slick, wondrously edited film. The action scenes are also unmatched. Beautifully choreographed and flawlessly executed, it feels like he’s put to good use the lessons he learned when orchestrating Scott Pilgrim vs. the World‘s action packed moments. There are a couple of character decisions that don’t quite strike home, though I guess the get out of jail free card is the fact that everyone’s getting more and more pissed as the film goes on. 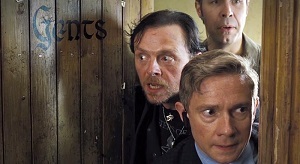 I think Hot Fuzz is still my favourite of the three, but The World’s End is a fantastic watch.